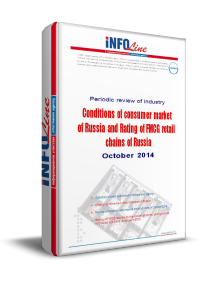 Conditions of consumer market of Russia and Rating of FMCG retail chains of Russia: October 2014. Industry review "Conditions of consumer market of Russia and Rating of FMCG retail chains of Russia: October 2014" contains structured information about development of retail chains, comissioning of new stores, new formats, mergers and acquisitions, corporate events, logistics, results of operations and forecasts, investment plans and cooperation with leading suppliers of retail chaines in FMCG format. This review also includes: macroeconomic indicators, statistics and analytical information about development of retail and commercial chains in Russia in the reporting month, results of 2013, information update on October 2014.